Andrew Lysaght Park is a rest park that was originally the location of the oldest known burial ground in Wollongong, located on the corner of Crown Street and Quilkey Place, Wollongong. Between 1830 and 1914, the park was a Roman Catholic Cemetery with 314 people known or believed to be buried on the site. Among these are some of the first residents of Wollongong including Jane Rose, whom arrived with the First Fleet in 1788, and Andrew Lysaght, the former mayor and member of parliament after whom the park acquired its name. 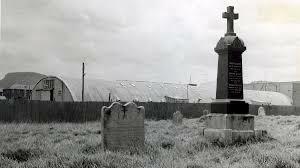 Since the last interment in 1914, the cemetery had been largely neglected and fell into disrepair. In 1998, in conjunction with the extention of a grandstand in the Wollongong Entertainment Centre complex, Wollongong Council redeveloped the park as the Foreshore Plaza and raised terrace. With respect to the deceased and their families, a memorial space was established, the 10 remaining headstones were mounted on a curved wall surrounding the Lysaght monument from the original cemetery. The memorial wall, designed by Richard Goodwin, is comprised of perforated curved steel panels made from fabricated Bisalloy, donated to the project from BHP Port Kembla Steel Works. The curved sculpture shields the site from prevailing winds and acts as a edge to the connection with the plaza. The southernmost wall is engraved with the list of the names and ages of the people recorded on the burial register. © 2013 - 2019 Illawarra Historical Society Inc.